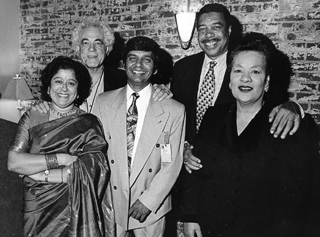 October 10, 1998: Three of Manick Sorcar's animation, "Deepa & Rupa: A Fairy Tale From India, "The Sage & The Mouse" and "The Woodcutter' Daughter" were screened at the Denver International Film Festival on October 10, 1998. It was a 'Recommended Film of the Day' selected by the movie critic of city's largest circulation newspaper The Denver Post, and was seen by a packed house of American audience at the Tivoli theatre. Prior to the show, Sorcar was formally introduced as the "Director in Person" to the audience by Mr. Ron Henderson, the Executive Director of the Festival, where Manick received a warm welcome. At the Reception Banquet, Manick was congratulated by Denver Mayor Wellington Webb for his outstanding animation which are regarded as the "cultural bridges between East and West" and highly popular at the elementary schools. Produced in English, "Deepa & Rupa: A Fairy Tale From India" received several awards including the Gold Plaque at the Chicago International Film Festival for Best Children's Program and nominations for three regional Emmy awards, "The Sage and the Mouse" received the Gold Medal at the International Film Festival of New York, and the recently released "The Woodcutter's Daughter" was awarded the Finalist Certificate at the 40th New York Festivals. All of Manick's animation were telecast in PBS stations of USA, and Doordarshan, India.